Biography*: Béla the Blind (Hungarian: Vak Béla; Croatian: Bela Slijepi; Slovak: Belo Slepý; c. 1109 – 13 February 1141) was King of Hungary and Croatia from 1131. He was blinded along with his rebellious father Álmos on the order of Álmos's brother, King Coloman of Hungary. Béla grew up in monasteries during the reign of Coloman's son Stephen II. The childless king arranged Béla's marriage with Helena of Rascia, who would become her husband's co-ruler throughout his reign. Béla was crowned king at least two months after the death of Stephen II, implying that his accession to the throne did not happen without opposition. Two violent purges were carried out among the partisans of his predecessors to strengthen Béla's rule. King Coloman's alleged son Boris tried to dethrone Béla but the king and his allies defeated the pretender's troops in 1132. In the second half of Béla's reign, Hungary adopted an active foreign policy. Bosnia and Split seem to have accepted Béla's suzerainty around 1136. 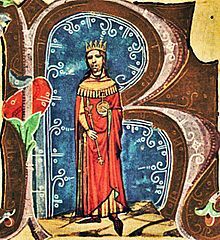 Biography*: Álmos (also "Almus", Slovak, Croatian: Almoš; c. 1070 or 1075, – 1 September 1127 or possibly in 1129) was a Hungarian prince, the son of King Géza I of Hungary and brother of King Coloman. He held several governmental posts in the Kingdom of Hungary. Álmos was the younger of the two sons surviving infancy of the future King Géza I. His mother seems to have been his father's first wife, Sophia, because Géza's Byzantine second wife—whose baptismal name is unknown—returned to her homeland after her husband's death. Both Álmos and his elder brother, Coloman, were born around 1070, according to the historians Gyula Kristó and Márta Font. Géza I who ascended the throne in 1074 died on 25 April 1077. He was succeeded by his brother, Ladislaus I, because Coloman and Álmos were still minors. The new king decided that Coloman should be prepared for a career in the Church. The king's decision was unusual, because Coloman was elder than Álmos. Between 1084 and 1091 Álmos was the duke of Slavonia; between 1091 and 1095 he was named duke of Croatia. According to the Illuminated Chronicle both Coloman and Álmos accompanied their uncle on a military campaign against Bohemia in the spring of 1095. Before reaching the border of his kingdom, Ladislaus I "was overcome by a grave infirmity" and decided to appoint Álmos as his heir. However, Coloman did not want to respect his uncle's decision and fled to Poland. Coloman returned after King Ladislaus had died to claim his rights. According to the Illuminated Chronicle, it was his uncle who had invited him back from Poland. The same source adds that Álmos "in the true simplicity of his heart honoured his brother, Coloman, and yielded to him the crown of the kingdom", which suggests that Coloman ascended the throne without bloodshed. On the other hand, he was only crowned king in early 1096, implying that the two brothers had been fighting for the crown before they reached an agreement. Coloman was crowned in Székesfehérvár by Archbishop Seraphin of Esztergom. According to the Illuminated Chronicle, at the same time he "granted the dukedom with full rights" to Álmos. This report shows that Álmos only acknowledged his brother's rule in exchange for receiving the one-time ducatus or duchy of their father and grandfather, which encompassed one-third of the kingdom. After Coloman's victories over the marauding crusaders in 1096, Henry IV, Holy Roman Emperor, whom Ladislaus I had supported against Pope Urban II in his last years, wrote a letter to Duke Álmos. He stated that Coloman had "neglected" his "interests because of his own necessities" and asked Álmos to intervene on his behalf at Coloman. However, the king—a former bishop—did not continue his predecessor's foreign policy and joined the pope's camp. Historian Gyula Kristó writes that the fact that his brother, Álmos had for years had a close relationship with Emperor Henry may also have influenced Coloman's decision. Coloman invaded Croatia and participated himself in the campaign in 1097. Taking advantage of Coloman's absence, Álmos began to conspire against the king and mustered his armies. Coloman returned from Croatia and marched towards his brother's duchy with his troops in 1098. The two armies encountered at Tiszavárkony, only the river Tisza separated them. However, the commanders of the two troops started negotiations and decided not to fight against each other, compelling Coloman and Álmos to make a peace. Biography*: Predslava of Kiev (fl. 1104–07) was a Rurikid princess, the daughter of Sviatopolk II, the Grand Prince of Kiev (r. 1093–1113). She married Hungarian prince Álmos, with whom she had three children, one of whom was the later King of Hungary, Béla II (r. 1131–1141). Adelaide, (c. 1107 – d. after 1140), married Sobieslav I of Bohemia in 1123. Béla II (c. 1109–1141), King of Hungary (r. 1131–1141). Hedwig, or Sophia (c. 1107–1138), married Duke Adalbert of Austria in 1132. Biography*: Géza I (Hungarian pronunciation: [??e?z? 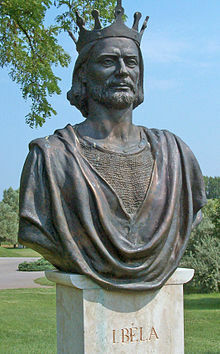 ]; Hungarian: I. Géza; c. 1040 – 25 April 1077) was King of Hungary from 1074 until his death. He was the eldest son of King Béla I. His baptismal name was Magnus. With German assistance, Géza's cousin Solomon acquired the crown when his father died in 1063, forcing Géza to leave Hungary. Géza returned with Polish reinforcements and signed a treaty with Solomon in early 1064. In the treaty, Géza and his brother, Ladislaus acknowledged the rule of Solomon, who granted them their father's former duchy, which encompassed one-third of the Kingdom of Hungary. In early 1074, Géza had approached Pope Gregory VII to obtain international recognition of his rule. However, the pope wanted to take advantage of the conflict between Solomon and Géza and attempted to persuade both of them to acknowledge the suzerainty of the Holy See. 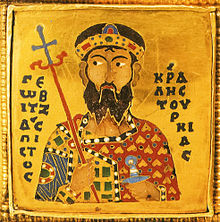 Géza did not obey the pope and asked the Byzantine Emperor Michael VII Doukas for a crown. The emperor sent Géza a gold and enamel diadem, which bore the legend "Géza, the faithful king of Hungary" on one of its plaques. This "splendid work of art" became the lower part of the Holy Crown of Hungary by the end of the 12th century. Géza was crowned king with this diadem in early 1075. In this year he styled himself as "anointed king of the Hungarians by the grace of God" in the charter of the foundation of the Benedictine Abbey of Garamszentbenedek (present-day Hronský Be?adik, Slovakia). Biography*: Béla I the Champion or the Wisent (Hungarian: I. Bajnok or Bölény Béla, Slovak: Belo I; c.?1015 – 11 September 1063) was King of Hungary from 1060 until his death. He descended from a younger branch of the Árpád dynasty. Béla's baptismal name was Adalbert. He left Hungary in 1031, together with his brothers, Levente and Andrew, after the execution of their father, Vazul. Béla settled in Poland and married Richeza (or Adelaide), daughter of King Mieszko II of Poland. He returned to his homeland upon the invitation of his brother Andrew, who had in the meantime been crowned King of Hungary. Andrew assigned the administration of the so-called ducatus or "duchy", which encompassed around one-third of the territory of the Kingdom of Hungary, to Béla. The two brothers' relationship became tense when Andrew had his own son, Solomon, crowned king, and forced Béla to publicly confirm Solomon's right to the throne in 1057 or 1058. Béla, assisted by his Polish relatives, rebelled against his brother and dethroned him in 1060. He introduced monetary reform and subdued the last uprising aimed at the restoration of paganism in Hungary. Béla was fatally injured when his throne collapsed while he was sitting on it. Biography*: Vazul, or also Vászoly, (before 997–1031 or 1032) was a member of the House of Árpád, a grandson of Taksony, Grand Prince of the Hungarians. Otherwise, the only certain information of his life, that he was kept in captivity and blinded in the fortress of Nyitra (Nitra, Slovakia) in the last years of the reign of his cousin, King Stephen I of Hungary. Modern historians, including György Györffy, do not exclude that he had earlier been Duke of Nyitra. He is the forefather of nearly all Kings of Hungary who reigned after 1046. Biography*: Mieszko I (c.?930 – 25 May 992) was the ruler of the Polans from about 960 until his death. A member of the Piast dynasty, he was a son of the legendary Siemomys?, and a grandson of Lestek. He was the father of Boles?aw I the Brave (the first crowned king of Poland) and of Gunhild of Wenden. Most sources make Mieszko I the father of Sigrid the Haughty, a Nordic queen, though one source identifies her father as Skoglar Toste, and the grandfather of Canute the Great (Gundhild's son), and the great-grandfather of Gunhilda of Denmark, Canute the Great's daughter and wife of Henry III, Holy Roman Emperor. The first Christian ruler of territories later called Poland, Mieszko I is considered the creator of the Polish state. He continued the policy of both his father and grandfather, who were rulers of the pagan tribes located in the area of present-day Greater Poland. Through both alliances and the use of military force, Mieszko extended ongoing Polish conquests and early in his reign subjugated Kuyavia and probably Gda?sk Pomerania and Masovia. For most of his reign, Mieszko I was involved in warfare for the control of Western Pomerania, eventually conquering it up to the vicinity of the lower Oder River. During the last years of his life, he fought the Bohemian state, winning Silesia and probably Lesser Poland. Mieszko I's alliance with the Czech prince, Boleslaus I the Cruel, strengthened by his marriage in 965 to the Czech P?emyslid princess Dobrawa, and his baptism in 966 put him and his country in the cultural sphere of Western Christianity. Apart from the great conquests accomplished during his reign (which proved to be fundamental for the future of Poland) Mieszko I was renowned for his internal reforms, aimed at expanding and improving the so-called war monarchy system. 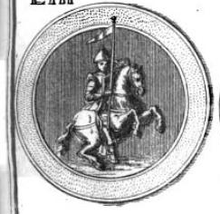 Biography*: Henry IV (c.?1112 – 14 August 1196), called the Blind (l'Aveugle or der Blinde), was count of Luxembourg from 1136 until his death and count of Namur (as Henry I) from 1139 until his abdication in 1189. He was the son of Godfrey I, Count of Namur and Ermesinde, a daughter of Conrad I of Luxembourg. He inherited the counties of La Roche and Durbuy from his cousins Henry II of Durbuy and Henry of Laroche. When another cousin, Conrad II of Luxembourg, died he was granted that county by the Emperor Lothair II, who thus prevented its passing to the French count of Grandpré. At the same time he also inherited the advocacies of the abbeys of Saint-Maximin at Trier and Saint-Willibrord at Echternach. This was the cause of many conflicts with Albero of Montreuil, archbishop of Trier. Three years later, he inherited Namur from his father. In 1141, he helped Alberon II, Bishop of Liège take Bouillon with Renaut I of Bar. In 1147, he gave up Saint-Maximin, but he regained it on the death of Archbishop Albero de Montreuil in 1152. The new archbishop, Hillin of Falmagne, exchanged the rights over the abbeys with the town of Grevenmacher in 1155. In 1157, he married Laurette (d.1175), daughter of Thierry of Alsace, Count of Flanders, and Margaret of Clermont. They separated in 1163. Left without child, he designated his brother-in-law Baldwin IV of Hainault, husband of his sister Alice of Namur, as his heir. When Baldwin died in 1171, he designated Baldwin V. Baldwin V and Henry carried out two wars, in 1170 and 1172, with Henry III of Limburg. In 1171, Henry married a second time, this time to Agnes, daughter of Henry I, Count of Guelders and Agnes of Arnstein. Heirless still, he repudiated her in 1184, but fell seriously ill and rejoined her. 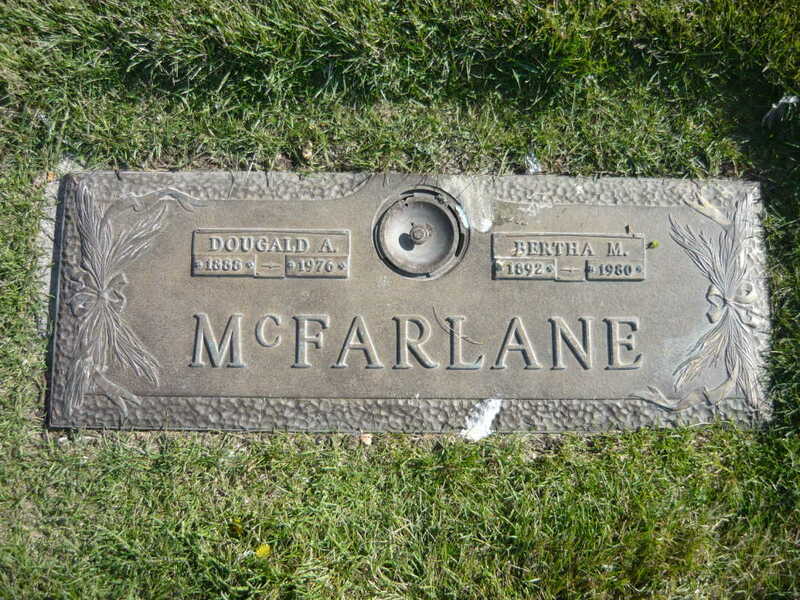 In September 1186, a girl, Ermesinde, was born to them. This birth called into question the plan of succession, as Henry considered his promise to Baldwin null and void. Henry, then 76 years old, pledged his daughter in marriage to Henry II of Champagne. Baldwin still claimed his inheritance. It was then decided that Baldwin would inherit Namur, Ermesinde would inherit Durbuy and La Roche, and Luxembourg (fief masculin) would revert to the Empire. [S746] Wikipedia, online http://Wikipedia.com, https://en.wikipedia.org/wiki/Henry_IV,_Count_of_Luxembourg. [S1168] Winnipeg Free Press, a March 16, 1976. Alexander Stewart (1477 – 19 December 1537) was a Scottish prelate; also known as Alexander Stewart of Pitcairn. He was the son of Alexander Stewart, Duke of Albany, and his first wife Catherine Sinclair, daughter of William Sinclair, Earl of Orkney and Earl of Caithness. The marriage of his parents was dissolved in 1478 and his father remarried, but it was not until 1516 that an act of parliament made the marriage unlawful and ensured that Alexander jr would be regarded as legally illegitimate and unable to inherit his father's title.